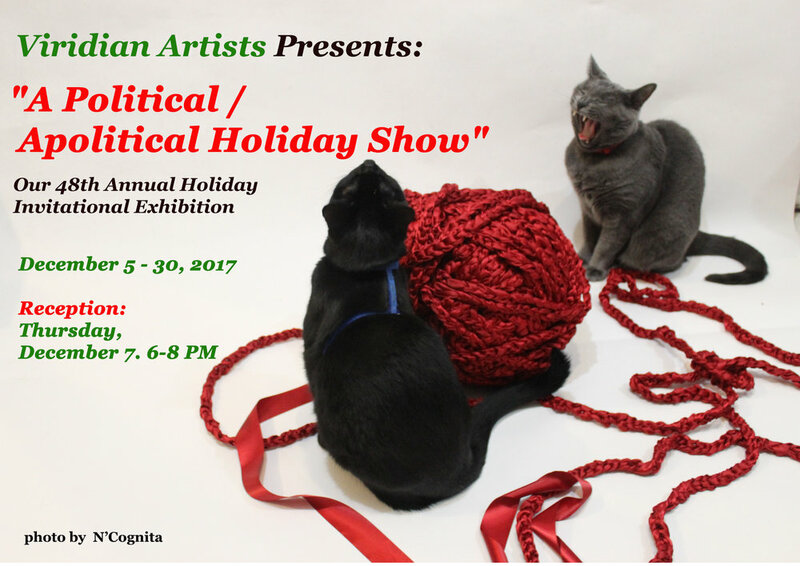 Chelsea: Viridian Artists' 47th annual holiday invitational, “A Political Apolitical Holiday Show” will open December 5th with a reception Thursday, December 7th, 6-8PM. The exhibition continues through December 30th, 2017. As we near the close of 2017, many of us are filled with a sense of trepidation and apprehension about the future of our planet, but we cannot give up hope. Though the populations of today's world are afflicted with anguish and fearfulness about the ever-pressing reality of war, starvation, political upheaval, religious intolerance, global warming and more, we must celebrate the good. Despite the bad, there is much in the world to celebrate. In early, more primitive times, many cultures realized that the artist was the shaman who possessed the powers that could make us well, create wealth, power, destroy illness and evil. It was art, not science that soothed the spirit – it was art that saved us. With the power of the creative spirit in mind, Viridian has invited artists to present their art to aid in the healing of your spirit, or perhaps to just remind you of what we must fight against. In addition, to aid visitors in finding gifts for those who matter in their lives, the gallery has created its annual Olde Arte Shoppe filled with artist-made gifts of prints, photography, jewelry, cards, etc. all priced under $100 for last minute holiday shopping or just for giving t o oneself... Come, dress festively & celebrate the power of art within us.